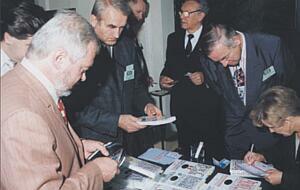 Its current owner Mr. Leszek Plak established the firm in 1991. Why is it called PLACET? Is it because it sounds similar to the owner’s surname? No. PLACET – which means in Latin “it is agreed, it is resolved, it seems good.” is a philosophy of doing things in an agreeable way and for the pleasure of people. We adopted this word as the name of our firm because we wanted to bring this philosophy into our work. The focus of the firm was determined right from the beginning. It was decided to publish books on the subjects of business management, finance and economics. This was based upon the interests and experiences of its owner, and also the anticipated market needs as a result of the transformation of the Polish economy. These topics, of course, were not new as far as the existing publishing market was concerned, as there were already much bigger existing publishing houses specializing in them. So further narrowing of the chosen direction was needed to distinguish our firm from many others and sometimes much stronger players on the market. It was decided that our firm would publish only certain types of books on the chosen subjects – books, which represent certain academic standards and could become the study material for the universities, colleges or the businessmen who would like to develop their skills in the field of structures and methods of business management. So this became the mission of our firm. However, further questions arose. How to make it happen in an attractive way? How to translate it into the real product, which would be attractive to the potential clients? What should the books include and how to make them different? In our opinion the most important element is the author. We try to find them among the academic staff of Polish universities, or from the foreign publications that present the subjects that interest us in a modern and innovative way. Also we try to convey the knowledge in a simple and understandable manner for all potential readers. We are aware that the subjects are sometimes difficult; therefore we make sure that the language used in our publications is as clear as possible. We do not favour usage of foreign words in Polish spelling, but we try to name things in Polish language quoting at the same time the English terminology. We also try to avoid the professional jargon understandable only by the people specializing in the particular subject. Spreading the knowledge in a professional and at the same time transparent way became our principle. We encourage our authors and other people working for us to follow these rules. However it might be sometimes difficult because not all authors or publishers have the gift of writing in this specific manner. Nevertheless, the constant co-operation of all those involved, and reminding ourselves about our principles, produce satisfactory results. Our books are readable and understandable by everybody. which was very popular with delegates. Two people had a great influence on our firm and played a big role in bringing our ideas to life. 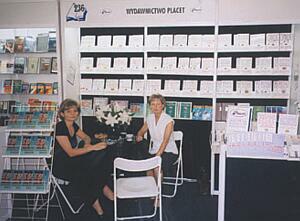 The first person, Mrs. Renata Praglowska-Woydt, edited many of our books. She is able to formulate any thought in the short, exact and the most synonymous way. She taught us a lot. The second person was Professor Tadeusz Sztucki. He was the author of the first Polish book about modern marketing, which was published under the title “Marketing – the way we think, the way we do”. This book was the best-selling textbook for many years and helped thousands of the new emerging marketing people to learn their trade. Mr. Sztucki also was a person with a special gift of passing on his great knowledge to others and also of drawing peoples’ attention by the way he spoke or wrote. which is devoted to academic publications. The other way by which we try to follow our principles is keeping the typography of our books consistent. This demonstrates itself in our book covers and the graphical layout of the text. Using different graphics we try to distinguish the important parts of the text to draw the readers’ attention to it and also, if necessary, to enable them to find the relevant text easily. Most of us have a visual memory and remember words or phrases better if they stand out in some way. Our principal series of books is called “Businessman’s Library”. The first book published in this series had the cover designed specially to fit our mission. Contrary to the books of other publishing houses available on the market at that time, which relished in the very colorful covers, our cover remained white with black writing and the logo of the series embossed in the middle. The embossed logo was meant to prevent the making of “pirate” copies of the book rather than as an element of presentation. In those days we were selling about 10,000 copies of this book within just a few months and the “pirate” copies was a real threat. Today this logo is a very important part of our firm. It is recognizable in the Polish publishing market and it is a sign of the high quality we are always aiming to achieve. 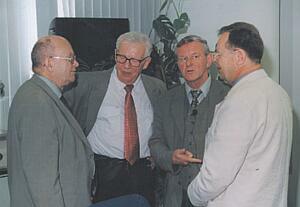 Professor Ireneusz Durlik, Professor Ryszard Borowiecki and Mr. Leszek Plak). At present, the series “Businessman’s Library” consists of 50 titles. The authors who published their books in this series are the best in Polish market. Foreign publications, which we think are interesting and beneficial to Polish readers, are also translated. This series is very popular. We have a very wide circle of customers, who collect every title and give us valuable feedback. Some of the titles are in their sixth edition. The authors of some books published in this series received high-ranking awards: 5 awards of the Ministry of Education, numerous awards of the Polish Economic Society and the Association of Business and Management. Our reward is the one given to us by our readers and can be measured by hundreds of thousands copies sold, flattering letters and telephone calls and encouragement to carry on. There cannot be a better award for the publisher then the compliments received from readers who say: “Reading your books I understand …”. It also means to us that our mission has been accomplished. - ready to receive visitors. 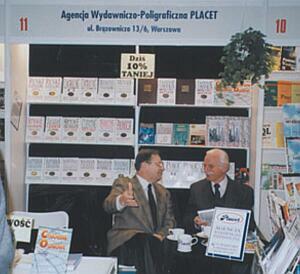 After 10 years of operation “Placet” is not only a firm of one series of books. We publish books in other series, bio-lingual books, guides, dictionaries and language courses. They are also linked to our main subjects of business and economics. Since the beginning of the Internet we are also developing our web site. Apart from the general information about the firm and our books, quite recently we published there our dictionary “Business Lexicon” with the built in search engine by Polish or English terms. We also started the first Polish Internet magazine “Finance and Management” where we publish articles of Polish academics. We are hoping to create the universally accessible learning base on finance and management of business. What will the next 10 years bring?? ?